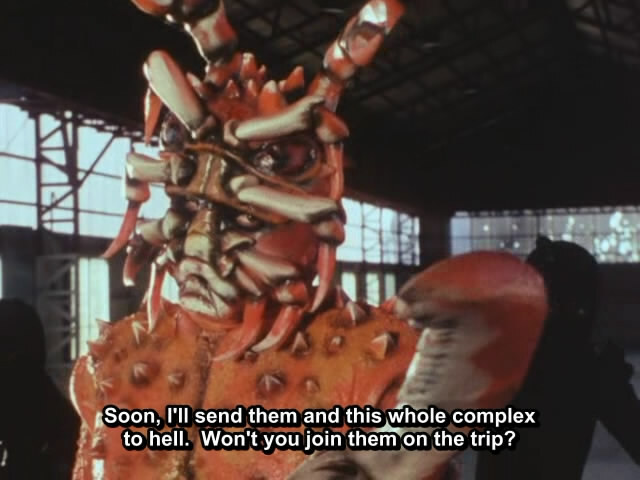 KITsubs: Kamen Rider Skyrider Episode 10! Kamen Rider Skyrider Episode 10! Yes, I know that I promised Kamen Rider 15 this week. Unfortunately, we had a (now resolved) script problem and we just so happened to have a finished Skyrider script... so here we are. But that's ok! Because this is a very fun episodes, and a sign of things to come for Skyrider as a show. The tone of the show is changing, and it's starting to show its true colors as an anniversary show, as opposed to a remake of the original. Once the first "climactic final showdown" takes place, you'll start to see it even more. As for the name "CrabberMan," let me justify myself here. "Kani" means Crab in Japanese, but his Japanese name is "KaningerJin." From my understanding, "ger" in certain Japanese words (mostly of foreign origins) is like adding "er" in English; it establishes that this word is "doing" something. Use "Toast" and "Toaster" for example, a toaster... makes toast! For precedence in Japanese pop-culture, look to "Mazinger." Go Nagai once stated that the name was originally supposed to be reminiscent of the word "Majin" (or evil person) and have the sense of being "capable of doing evil." So Majin-ger would (almost) literally mean "One who does evil." That, and I thought that CrabberMan sounded silly. WELL, that rant was long! Kamen Rider 15 is DEFINITELY coming next week. Thanks for watching, everyone! Just saw that. Fixing it now, the upload failed. The MKV is working now. New AVI link coming soon. Sorry, everyone! AVI is updated, too. Sorry for that problem, everyone! Kamen Rider Skyrider Episode 09!